Foie gras: Smooth, rich and best eaten cured. 3 Can You Fry Frozen Tilapia? 4 How Long Does It Take for Pork to Spoil When Not Refrigerated? Literally meaning "fat liver," the French pate delicacy foie gras comes from the plump livers of force-fed ducks or geese. While most foie gras is cooked and cured before sale, you can buy foie gras in raw chunks known as lobes. If you buy foie gras raw, be sure to cook it before eating. Note that at the time of publication, foie gras was banned in California due to the controversial method of production. 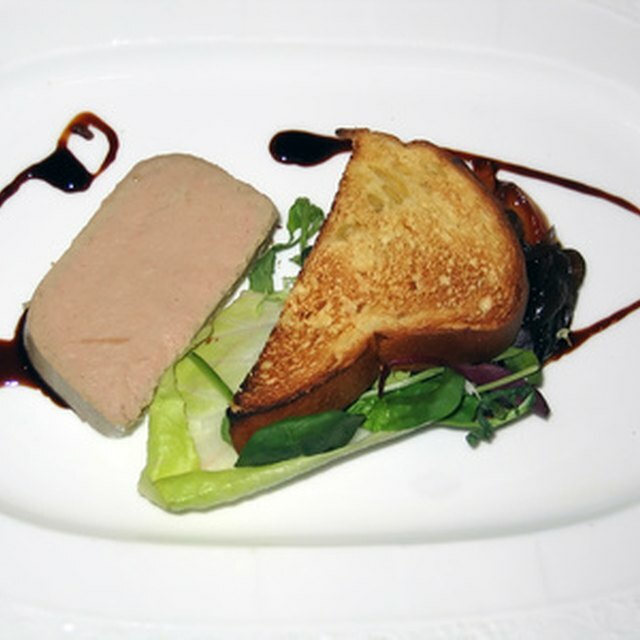 Raw foie gras, sometimes called foie gras cru, is usually sold as a whole bird's liver, or in a few large pieces. Often, it's a lower grade than cured foie gras, with a red veins running through the liver. This raw, unrefined foie gras is never eaten without some form of curing or cooking. Chefs might use raw foie gras to make sauces, or they prepare the raw liver and cure it into a more refined pate. The curing process for foie gras involves mixing the liver with salt and other seasoning, wrapping the pate in tight cloth, and hanging for several days in a cool pantry or refrigerator. After hanging, the liver is poached in water or light stock to cook the cured pate. Duck liver generally has the stronger taste, while foie gras made from geese has a more subtle flavor. Great chefs aim for a rich, smooth foie gras with no color variations. If you're preparing your own raw foie gras, be sure to pick out the veins with tweezers and a flat knife. Left in, these veins cause changes in color and consistency. Roll foie gras into a firm sausage shape using a bamboo sushi mat and plastic wrap. Some recipes suggest poaching the pate at temperatures of 140 degrees Fahrenheit and lower. However, to make sure the foie gras is safe to eat, aim to get the internal temperature to 160 degrees F before the poaching ends. Raw foie gras will keep safely in a refrigerator set between 32 and 39.2 degrees Fahrenheit, according to "Foie Gras" Magazine. However, even when cured and cooked, foie gras can pose health risks to vulnerable people. The FoodSafety.gov website lists meat pastes and pates such as foie gras as leading sources of listeria poisoning. Eating raw or badly stored foie gras increases the risk significantly. In particular, pregnant women and older people should avoid foie gras altogether.